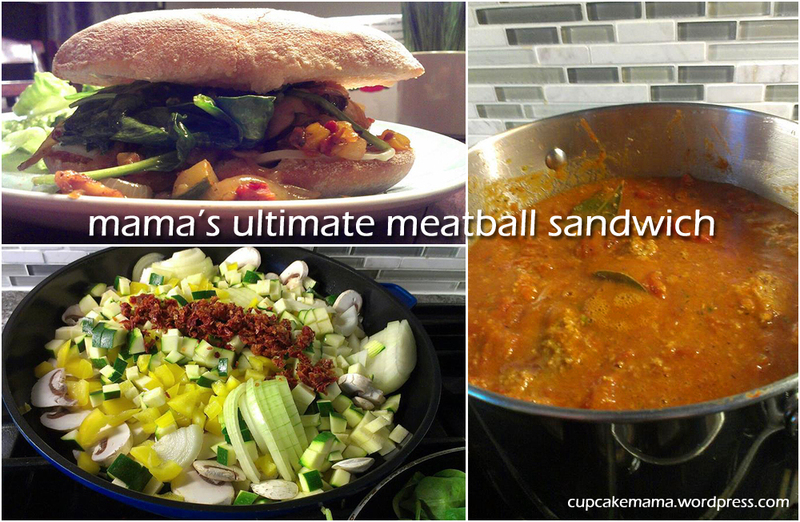 Topped with sticky sweet panfried veggies and cheese, this meatball sandwich is messy and comforting. A super great saturday night supper. Combine all sauce ingredients in a large pot and set to simmer on medium heat. Roll into 1.5 inch balls (a little larger than a golf ball) and plop them gently into the simmering sauce. Simmer for 10 minutes and then stir the meatballs (very gently) and cook for another hour, stirring every now and then. Combine above ingredients in a large frying pan and sautee over medium high heat, stirring often until golden and sticky. Combine above ingredients in a large frying pan and sautee over medium high heat, stirring often until spinach is just wilted but still bright green. Slice fresh baked italian or portuguese buns in half and butter. Fill sandwich with a few meatballs and a small scoop of tomato sauce. Top with provolone or mozzarella cheese, the veggie mixture and spinach. Enjoy with a salad, a nice glass of wine or beer and a large napkin!